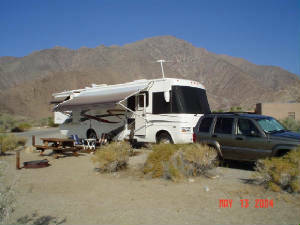 On May 12, 2004, we drove our motorhome and towed our Jeep Liberty to the Anza-Borrego State Park in the Anza-Borrego Desert in Southern California. This is one of Fred's favorite places and also served as a dry-run trip for towing the Jeep before our big trip to Wisconsin in June. We arrived in Anza-Borrego State Park late Wednesday afternoon. It was nearly empty of campers, which is something you only experience during the months of May through August when the weather is usually the hottest. It was surprisingly nice that first day. By late afternoon, the wind had picked up a lot and it cooled down to create a very pleasant evening. We slept really well that night with just the windows open and a strong, cool breeze blowing in the bedroom window. Unfortunately, it was the only night of our trip like that! The hill behind our motorhome in the photo is San Ysidro Peak. Thursday we drove our Jeep on its first off-road voyage through four miles of soft sand and rocks to reach Font's Point. At the end of the sandy road are look-out areas overlooking what's known as the Badlands. It looks very much like the Grand Canyon without as much color. It is amazing! That area can only be seen from Font's Point. To have such diversity in the same area is fascinating! On Friday, we met up with friends Pat and Sharri and took our Jeeps to The Slot and Hawk Canyon. 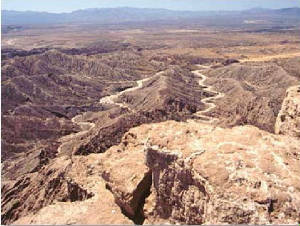 The Slot is the most accessible canyon in the Borrego Mountain Wash, with the narrowest portion about a foot wide. It looks like a challenging and fun hike and sometime on another trip, we will be prepared to take it. View a photo of The Slot from Hawk Canyon. As we approached Hawk Canyon, a hawk was soaring overhead, illustrating how the canyon got its name. 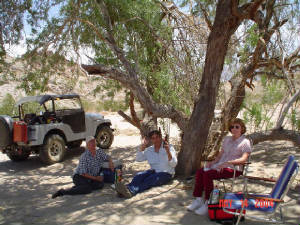 After driving around a while, we stopped for a picnic lunch and to relax in the shade of a desert ironwood tree. Ironwood trees only grow below an elevation of 2,500 feet in the washes and valleys of the Sonoran Desert, of which Anza-Borrego is a part. The Anza-Borrego Desert is a beautiful and fascinating place that changes with the seasons. The temperatures can vary drastically from season to season and from day to night. It is a part of the Colorado Desert in extreme southern California and northwestern Mexico. It also lies within the Sonoran Desert but the giant saguaro cacti do not grow here as they do in Arizona. The park name is derived from a combination of the name of Spanish explorer Juan Bautista de Anza and the Spanish word "borrego," referring to bighorn sheep. It is located on the eastern part of San Diego County with portions extending into Imperial and Riverside Counties. The park has over 600,000 acres, making it the largest state park in the contiguous United States. 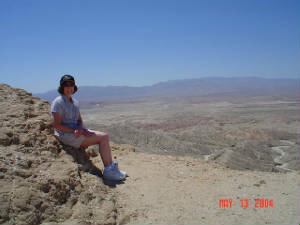 The photos here are just a tiny representation of the sights of the Anza-Borrego Desert State Park. One really has to experience it first-hand to appreciate the beauty and diversity it has to offer! Until next time, happy and safe travels to you!